Road Trips Gardeners wandering Connecticut this weekend should add a stop in Meriden for the annual Daffodil Festival. It’ll be today and tomorrow (April 30 and May 1, 2011) in Hubbard Park, Meriden, Connecticut. 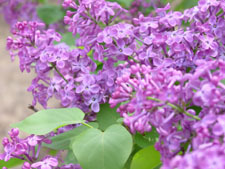 It’s the 22 year for Orchard in Bloom, an outdoor garden and landscaping extravaganza in Indianapolis, Indiana. Road Trips Gardeners know that the best selection is on the first day of the spring plant sale at Louis Ginter Botanical Garden, 1800 Lakeside Avenue, Richmond, Virginia. Check your travel calendars quickly, Road Trips Gardeners. The Belgian Royal Greenhouses are open to the public only from April 15 to May 8, 2011, this year. More than 600 species of native shrubs, trees, wildflowers and grasses can be found in Adkins Arboretum, a 400-acre native garden and preserve on Maryland’s Eastern Shore. The 10th edition of “Euroflora” takes place April 21 through May 1, 2011, in Fiera di Genova in Genoa, Italy.